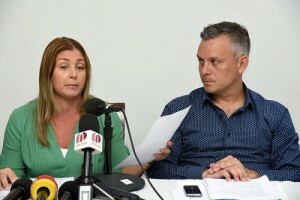 WILLEMSTAD - Gerrit Schotte and his wife Cicely van der Dijs have filed a complaint against the Member of Parliament for MAN, Yaël Plet for filing a false complaint against them. Schotte said this yesterday in a televised interview. After Plet filed a complaint about a possible attempt to bribery, the former Prime Minister Gerrit Schotte and the former Minister of Traffic, Transport and Spatial Planning, Charles Cooper became suspects in the case that was named Wilhelmina. Schotte also declared that Cooper and his wife will file a complaint and that everything Plet has said in his statement is a lie. According to Plet in his statement, he was offered more than 300,000 guilders to join the Gerrit Schotte group in parliament. He filed a complaint in mid-February this year. On February 18, the National Investigation Team started their investigation. This investigation led to three raids last week. These were at the house of Gerrit Schotte, Charles Cooper and a businessman, who Plet used to work for. The Public Prosecution (OM) stated that the raids took place following both an attempt to bribe as an actual bribery. From whom, by whom, the OM does not say. The OM limits itself to the statement that constituted several offences found during the investigation that prompted the raids.